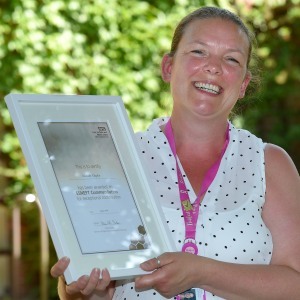 Stowmarket Community Health Team Lead, Michelle Chaplin was one of only two ESNEFT employees to receive a commendation earlier this year following her resolve to make patient visits during adverse weather conditions last winter. Nominated by the Stowmarket Team, Michelle was very quick to state that it was “amazing” to receive the commendation and paid tribute to her team whose “resilience shone through” with every member pulling together, and some even coming in on annual leave to help out. While we are still enjoying a particularly warm summer, it’s hard to remember the snow and harsh winter of just a few months ago. The challenging conditions that brought huge snowdrifts and freezing temperatures to the region saw many team members work even harder than usual to deliver excellent care and keep services going. Michelle Chaplin, team lead of Stowmarket Community Team, was one of them. Even though many rural parts of Suffolk were inaccessible by car, Michelle was not deterred. She collected staff from home to bring them into work by borrowing a John Deere tractor from a neighbouring farmer. 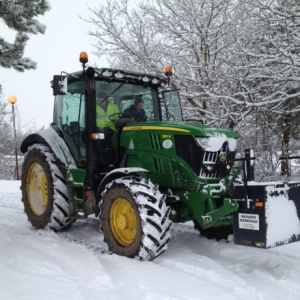 Michelle went on to use the tractor to drive nurses through the countryside to visit their patients who were not able to be reached by car due to severe snow drifts. Michelle borrowed two further tractors with volunteer drivers for other community teams so they could also fulfil their commitments to see their patients. She worked “tirelessly” to maintain morale within her team, whilst ensuring the safety of her staff at all times. After the event, Michelle emailed everyone in her team to thank them for their hard work, but they all agreed that without her amazing efforts, many patients would have gone without their essential nursing visits. After the event, Michelle emailed everyone on her team to thank them for their hard work, but they all agreed that without her amazing efforts, many patients would have gone without their essential nursing visits.